Editor’s Note: This week we’re at the joint 48th meeting of the Division for Planetary Sciences (DPS) and 11th European Planetary Science Congress (EPSC) in Pasadena, California. Along with astrobites author Natasha Batalha, I will be writing updates on selected events at the meeting and posting at the end of each day. Follow along here or at astrobites.com! 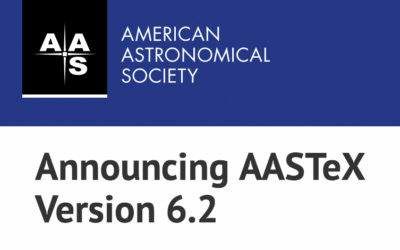 The usual posting schedule for AAS Nova will resume next week. Welcome to Day 3 of the joint 48th meeting of the Division for Planetary Sciences (DPS) and 11th European Planetary Science Congress (EPSC) in Pasadena, California! Two astrobiters are attending this conference, and we will report highlights from each day here. If you’d like to see more timely updates during the day, we encourage you to search the #DPSEPSC hashtag! Did you follow ExoMars’s Schiaparelli module as it attempted to land on Mars’s surface this morning? Today’s first press conference opened with an overview of the latest news from the attempt, given by Olivier Witasse (ESA). Witasse summarized the first phase of the mission, in which ExoMars’s Trace Gas Orbiter (TGO) enters in orbit around Mars and Schiaparelli attempts its landing. The primary goal of this phase is to test the technology for an entry, descent, and landing of a payload on Mars, but the mission has secondary science goals of studying the Martian atmosphere and conducting surface environment measurements. Schiaparelli’s anticipated landing on Mars was a complex, 6-minute process. Witasse informed us that, while the team received confirmation during this time of key milestones like the parachute deployment, contact was cut off before the final landing. As images from the lander weren’t supposed to be sent until after the landing, we don’t have more information from the lander itself; we’re currently waiting for telemetry from the Mars Reconnaissance Orbiter and info from TGO to find out what Schiaparelli’s status is. Witasse emphasized that the mission is “not nominal”, but it’s too soon to tell what happened. Meanwhile, however, we can focus on the very successful insertion of TGO into orbit! The next speaker, Ann Carine Vandaele (Royal Belgian Institute for Space Aeronomy), discussed some of the science that will be done with TGO. In particular, TGO’s NOMAD instrument will measure the chemical composition of the atmosphere, Mars climatology and seasonal cycles, and help us to build models of the planet’s atmosphere. TGO’s timeline begins with 2 orbits for calibration, and then the next year will be spent aerobraking to get the spacecraft into its final circular orbit around Mars. The official science mission begins after that point! Next, the focus of the press conference shifted to the hypothetical Planet Nine. Renu Malhotra talked about how we’ve further constrained the massive planet’s location based on the orbits of trans-Neptunian objects (TNOs). The longest-period TNOs all have periods that are integer multiples of each other. If we assume that’s because they’re in resonance with a distant, massive planet, we can get constraints on the orbit of that planet. Malhotra and collaborators find that a planet on an orbit with a ~665 AU semi-major axis could produce resonant TNO orbits consistent with what we see. You can read more about this here or check out the press release here. Finally, Mike Brown spoke about one of the latest discoveries he and his team have made about the possible effects of Planet Nine on the solar system. Brown pointed out that the Sun’s axis is tilted by about 6° with respect to the axis of the solar system. If everything formed from the same protostellar nebula, why the misalignment? He showed that the presence of a distant, massive planet on an inclined orbit can actually create that misalignment over time, as a result of the planet’s large mass and long lever arm. The tug of the planet’s gravitational force effectively tilts the solar system over its lifetime! 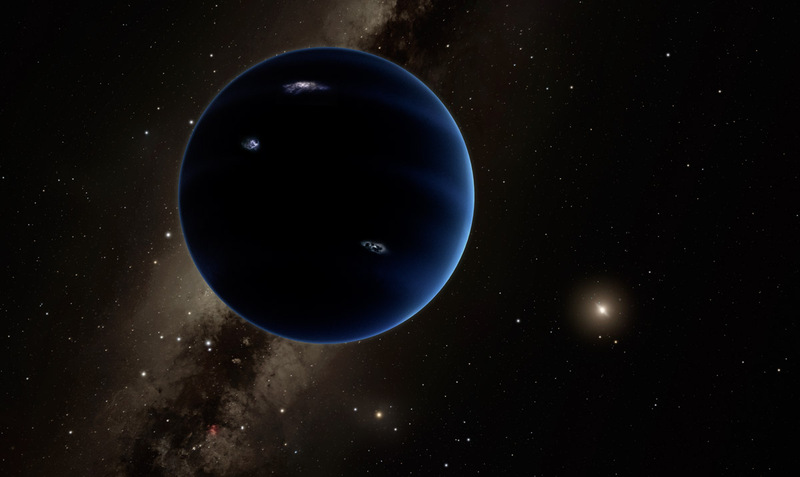 Brown’s models show that the predicted orbit and mass of Planet Nine are consistent with the 6° tilt that we see: chalk this up as one more piece of evidence supporting Planet Nine’s existence. The press release can be found here. In the second press conference of the day, we received updates on the mission status and science outcomes of the Juno mission to Jupiter. Juno, launched in 2011, is the second of NASA’s New Frontiers programs (the first was New Horizons mission to Pluto). It arrived at Jupiter on July 4th of this year, and it’s currently in a 53.4-day highly elliptical orbit around the planet. 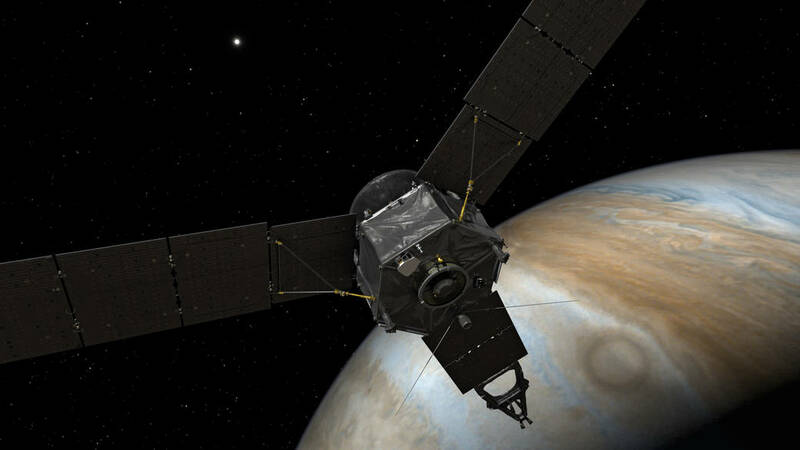 David Schurr, the deputy director of NASA’s Planetary Science Division, opened the conference with some bad news: the Juno spacecraft went into safe mode at 10:47 PDT last night, just 13 hours from its closest approach to Jupiter in its orbit. This means that the team wasn’t able to do the science pass they had planned during this second “perijove” flyby of the mission. Scott Bolton, Juno’s PI, provided more information about Juno’s current state. Bolton’s take on the recent events was calm: though the spacecraft evidently encountered something unexpected, it responded exactly how it was supposed to. Juno is currently healthy and in no danger, and it will continue on its current 53.4-day orbit while scientists analyze what triggered the safe-mode entry. This glitch follows on the heels of another, unrelated delay: last week the decision was made to postpone a burn of Juno’s engines to reduce its period from 53.4 days to 14 days. This “period reduction maneuver” was put off when unexpected behavior was discovered with a pair of valves operating the propulsion system. The team is currently analyzing this as well, to determine whether it will be safe to fire the engines on Juno’s next pass. When asked what he considered to be the worst-case scenario for the mission, Bolton drew laughs with his response: “I have to be patient and get the science slowly.” He elaborated that Juno’s current orbit will produce exactly the same science results as the planned 14-day orbit, just a bit slower! Bolton then walked us through a little of what we’ve learned from Juno so far. Details from this are discussed below, in Natasha’s summary of Bolton’s plenary talk later in the afternoon. Next Candice Hansen, JunoCam imaging scientist from the Planetary Science Institute, told us about the public outreach camera mounted on Juno. This camera was designed to engage the public with the Juno mission, but it turns out it’ll also produce lots of interesting science! Already, we have some spectacular images of Jupiter’s south pole (the first time this has been imaged) which reveal the region’s cloud structure. In particular, the pole is swirling with cyclonic storms, and the presence of one on the terminator provides us with new 3D information about the dynamics of the atmosphere. Analysis of this storm shows that it’s a whopping 7,000 km (more than half the size of Earth) across and towers ~85 km vertically. The public has several ways they can engage with JunoCam. Public input will drive the target selection for the camera, with proposals, discussion, and eventual voting planned to be enabled late this year or early next year. And all images taken with JunoCam are uploaded in raw format for anyone to download, process, and upload their final images. This has already resulted in some spectacular public-produced images using JunoCam data, viewable here, and should continue to result in stunning visuals and exciting science in the future! Dr. Scott Bolton followed up his press conference by giving a plenary talk on Juno’s early science results. Though Juno is currently in safe mode, the team is continuing to analyze data from the close flyby from August 27. Dr. Bolton started his talk by showing a new brightness map of the northern aurora. Just from this first map the team is “seeing things we did not expect”. Both the aurora and the magnetic field are much stronger than models previously suggested. The team is working on creating new models to match their preliminary observations. Gravity science also is forcing theorists to revisit their models and on December 11th, we will have a factor of 20 improvement in this data. Next, Dr. Bolton showed the audience observations taken with Juno’s Microwave Radiometer instrument (MWR). 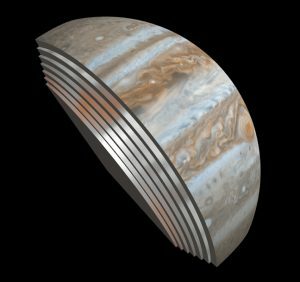 MWR’s mission is to understand and characterize the interior layers of Jupiter. There are six channels ranging from 1-50 cm wavelength which will each be able to penetrate down to a pressure of 200 bars (400 km). Already, the team can tell that the large banding structure that we see on the surface extends down to ~300-400 km. Juno’s main mission is to gain understanding of the Solar System’s beginnings by revealing the origin and evolution of Jupiter. Despite the current difficulties the team is having, Dr. Bolton ended by reassuring the audience that the team will still be able to complete all the goals it sought out at the start. After Dawn launched in September of 2007, it spent four years focused on studying Vesta, the second most massive asteroid. Since February 2015, it has been on course to study Ceres. Dr. Michael Toplis and Dr. Cristina De Sanctis tag-teamed the second plenary to reveal preliminary studies concerning Ceres. Like with Juno, Dawn is also trying to measure the gravity field of Ceres. Doing so will give us insights into whether or not Ceres is homogenous (is it a solid cue ball or a layered onion?). New gravity data has already ruled out a homogenous mixture. Instead, the Dawn team suggests that Ceres has a weak interior and that water and other light materials may have been partially separated from the rock. This layering is much weaker than the layering you find in Earth’s interior or even our very own Moon. The Dawn team has also been looking carefully at the surface of Ceres. 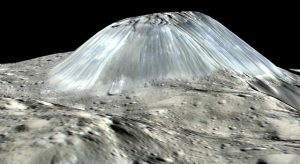 Right off the bat it is easy to see that Ceres is highly cratered, with one small exception: Ahuna Mons, a small, 3-mile-high mountain discovered by the Dawn team. Ahuna Mons is the only mountain on the entire object that might have been volcanic in origin. Along with the heavy cratering, Dr. Cristina De Sanctis discussed the discovery of phyllosilicates all over Ceres’ surface. Phyllosilicates are rich in magnesium with some ammonium in their crystalline structure. The fact that these are found all over Ceres’ surface means that the surface has been altered by some interaction with water. The team concluded by rounding up what all the information about Ceres is pointing to. It is possible that either Ceres formed in the trans-Neptune disk before it was implanted into the main belt, OR Ceres formed closer to its present position by accreting material that drifted from out at greater distances. More data will start to yield a better image of what is going on with this interesting object.